Zambia is a landlocked country in the tropics of southern Africa neighbouring the Democratic Republic of Congo, Tanzania, Malawi, Mozambique, Zimbabwe, Botswana, Namibia and Angola. David Livingstone was the first explorer to reach Zambia, navigating the Zambesi River; he arrived in this country, fell in love with the beautiful landscapes and remained for more than 20 years. Most of Zambia is part of the high, undulating plateau that forms the backbone of Africa. The plateau’s altitude is typically 1000-1600 meters above sea level. It is deeply incised by great valleys and gorges containing beautiful lakes and waterfalls, which are the centre of many national parks. It is a county of many wild landscapes that has managed to maintain an ideal balance between nature and tourism. The people are friendly and pleasant, and it is the perfect destination for those who want to live the quintessential African experience. It is also an ideal destination for those who enjoy outdoor activities such as rafting, canoeing, fishing and walking safaris. In fact, Zambia was the first country to carry out walking safaris, which are walking excursions with the aim of observing and photographing the incredible wildlife or just simply hiking and sightseeing with experts guides that help you to better understand the place you are visiting and the history behind it. Zambia is shaped like a giant butterfly, and it covers an area of 756.600 square kilometres, which is just slightly smaller than the UK and France combined. It has a population of 11.000.000 inhabitants with 44% of the population concentrated in a few urban areas along the major transport corridors. The rural areas, on the other hand, are quite sparsely populated. The territories outside of the main cities are still quite wild; in fact, roads are not well connected and many areas are inaccessible, which means that these places are quite remote and untouched and have remained as they were many years ago. The southern part of the country is the most visited because of two important cities: Lusaka (the capital) and Livingstone (the Victoria Falls City). In southern Zambia there is also Lake Kariba, the world’s largest man-made lake and reservoir by volume. Lake Kariba was filled between 1958 and 1963 following the completion of the Kariba Dam. This lake is a hydroelectric dam which provides huge quantities of energy for the country and which has recently become a tourist destination. In fact, tourists can participate in boat excursions and admire the flora and fauna of this part of the country. 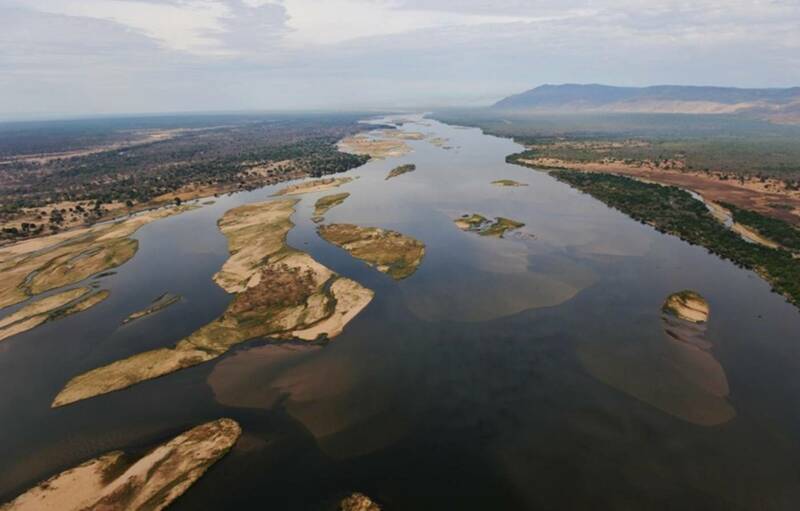 Lake Kariba, Lake Bangweulu and Lake Mweru (situated in northern Zambia) together with many smaller rivers contribute to the fact that Zambia holds 45% of the all the water resources of southern Africa. Zambia is one of the best destinations in Africa for safaris because visitors are certain to see many different animal species. It is quite easy here to spot elephants, hippos and buffalo near lakes and lagoons; zebras, impalas, antelopes, giraffes and predators such as lions, leopards, cheetahs and hyenas can be found all throughout the bush. There are 750 registered bird species, many species of snake, chameleons and frogs, and let’s not forget the crocodiles! More than half of the territory is covered by thick vegetation, specifically in the north, where the climate is more damp and the landscape is covered by forests, bushes and hardwood trees. In the south, on the other hand, the climate is drier with less vegetation and very tall trees. These climates lend themselves to the cultivation of a large variety of crops including tobacco, cotton, rice, tea, coffee, sugar, pineapple, mango, banana and avocado. 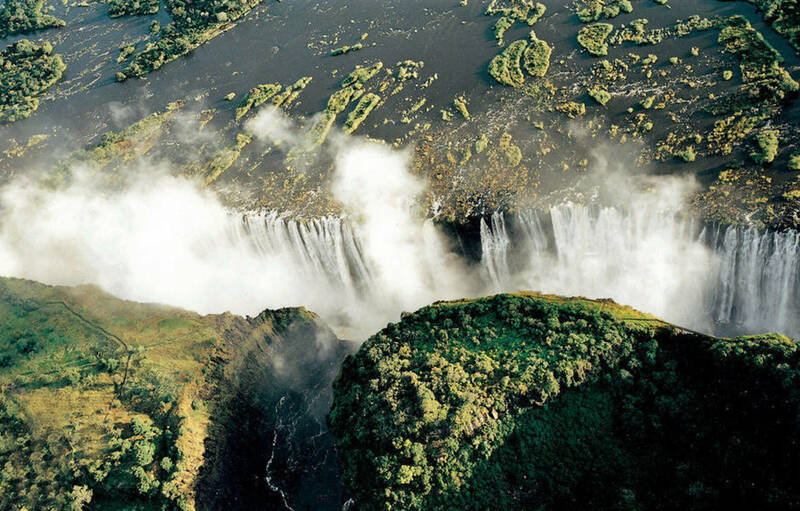 The Victoria Falls are located between Zambia and Zimbabwe. Victoria Falls National Park boarders the Zambezi River. On the Zambia side of the falls, the visitor is much closer to the falls so one sees the falls with a different prospective. While the view and the water flow are still impressive, you simply cannot get a proper visual to fully appreciate the full width of the cascade The best thing, if possible, is to visit the falls from both the Zambian and Zimbabwean sides. The falls are different at different times of the year. Depending on the period in which you visit the flow varies quite a bit. When the river level is at his highest during the rainy season (December to March), the water volume is higher, and the falls are much more dramatic. At this time one is guaranteed to get wet when crossing the bridge or walking along the trails that wind along near the falls. However, it is precisely this volume of water that may inhibit your viewing the actual falls as the view will be obscured by all the spray. For this reason many tourists stopping over for a longer periods in Africa choose to start and finish their visit here, in order to see the falls at two different moments in time. During the dry season, from April to October, the water volume is lower and it is easier to get a clearer view of the ledge beneath the falls, which is spectacular in and of itself. It is still a great experience to visit the falls in the dry season, as you can experience both the falls and the rocky gorge and swim in Devil’s Pool. Victoria Falls National Park is known as ‘Mosi oa Tunya’ – ‘The smoke that thunders’ by the local Kololo tribe because of the noise created by the 550 million litres of water that cascade 100 metres into the chasm below every minute during the Zambezi River’s peak flow. Obviously the falls were well known to the native people of southern Africa well before any European ever “discovered” them, but thanks to Livingstone’s determination, approaching them in November of 1855, they became known to the western world as Victoria Falls, after Queen Victoria. The falls are formed as the full width of the river plummets in a single vertical drop into a transverse chasm 1.708 metres wide, carved by its waters along the fracture zone in the basalt plateau. The depth of the chasm, also known as “the first gorge”, is 80 m on the west side and 108 m in the centre. If you look at the falls from the Zimbabwe side, you can distinguish 4 distinct zones: the Devil’s Cataract (70m high), the Main Falls (93m), the Rainbow Falls (108 m) and the Eastern Cataract (101m high). One of the most scenic views is from the Knife Edge Bridge. This bridge was constructed to enable foot access to the cliffs looking over Rainbow Falls. The flow, and hence the spray, is greatest just after the end of the rainy season, around March or April, depending upon the rains and it is recommended wearing a raincoat and to protect your cameras; however, in high season, a raincoat is largely ineffective as the spray blows all around and soaks you in seconds. Moonlight is a fascinating time, when the falls take on an eternal glow and the waters blend into one smooth mass and seem frozen over the rocks. If you visit the falls when the river is at its lowest, from November to December, you can sometimes walk across the bed of the Zambezi River as far as Livingstone Island. In 1989 the Cummings family established Chiawa Camp bringing tourism to the Lower Zambezi by opening the first safari lodge inside the national park. The park covers an area of 4.092 square metres, 120 km of which are along the Zambezi River. The riverbanks are overhung with thick riverine growth, including ebony and fig trees. Further inland there is a large floodplain interspersed with winter thorn trees, huge acacias and baobabs and fringed by weeping forests. Over 400 species of bird live in this park as well as many large mammals, including lions, leopards, elephants, buffalos and hippos. Most of the lodges are situated outside the park in a protected area called Chiawa GMA, but there are still a few camps inside. The camps offer many interesting and fun activities, and visitors can choose from an exceptional range. On the water, there are boat trips to explore the Zambezi, keeping an eye out for hippos, crocodiles and big birds; the more active may prefer to take to the waters in a canoe, or seek out the mighty tigerfish (though all fishing here is on catch-and-release basis). On land, visitors can go on game drives in open-topped 4WD vehicles or opt for a walking safari with a qualified guide and ranger. 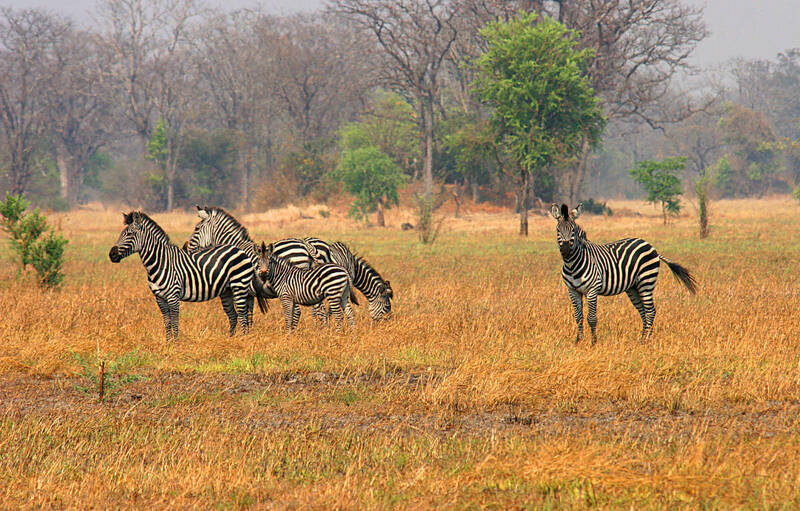 First established as a national park in 1950, this is the oldest and biggest Park in Zambia. It covers a massive 22.400 square meters and is one of the biggest natural parks in the world. Over 67% of the park is designated as “Wilderness Area”, where only walking safaris can be conducted. There are three rivers in the Kafue National Park: the Lunga, the Lufupa and the Kafue, which are extremely important for the life of the many different animal species that thrive there. The park hosts 55 species of mammal including the unique Sitatunga antelope and the red lechwe. The eco-region is a savannah grassland with miombo trees, and, in the rainy season, a few small dambos (grassland that become marshy during the rainy season). On the southern side of the park, mopane trees adapted to hotter, drier conditions replace the miombo, and the area is a unique place for walking safaris, 4WD vehicle safaris, bird watching on the river or fishing. This park is not well known as it is not easy to access during some of the seasons, which makes it, for those who choose to go, a unique and unforgettable experience. Hailed by some as one of the greatest wildlife sanctuaries in the world, South Luangwa is one of Zambia’s most important destinations. This park, which spans just over 9.000 square kilometres, is centred around the Luangwa River and is home to one of Africa’s largest concentrations of wildlife. Here, visitors can spot lion, buffalo, zebra, giraffe and thornicroft. The park also hosts the biggest population of elephants in the whole country, and numerous cheetah roam the park. The Luangwa River is populated by hippos and crocodiles. South Luangwa is mostly dryland and woodland, watered by the meandering Luangwa River and its many oxbow lakes. The dominant tree is the mopane, but stately baobabs also dot the landscape here and there. The founder of the park was Normann Carr, a British conservationist that worked in central and southern Africa, he was also the first person to organise walking safaris. He worked on the conservation of few key areas of the country and built Nsefu Camp, creating the first area dedicated to tourists, which was later followed by Kapani Lodge. The biggest companies that manage the camps are Norman Carr Safaris, Robin Pope Safaris and Bushcamp Company, with luxurious, comfortable tented camps in stunning locations. The camps organize walking safaris, where tourists trek over a few days covering approximately 10km a day and sleeping in mobile tented camps every night. This is quite a unique experience and highly recommended for the adventurous traveller. This remote tract of land, covering 4.636 square kilometres, offers one of the finest wilderness experiences in Zambia, if not Africa itself. It is not open to the public and there are no permanent lodges there. Access to the park is granted only through one of the few safari operators granted permission to conduct walking safaris in the park during the period from June to October. It is not open to the public and there are no permanent lodges. There are a number of tributary rivers running through the park and into the Luangwa, which plays an important ecological role in the area. The crystal-clear Mwaleshi River trickles down the escarpment in a series of small waterfalls, receding in the dry season and leaving many pools along the way, drawing the animals from the bush to its banks in search of water. The vegetation ranges from mopane woodland to riverine forest, open grasslands and acacia thicket. Trees include the beautiful sausage tree, vegetable ivory palms, red mahogany and leadwood. At the Angolan border, this park covers 3.600 square kilometres of pure wilderness. There are only a few lodges and the best time to visit the park is between June and December, but the most interesting is definitely from November to December when many species migrate south further into the park with the onset of the rainy season. It hosts wildebeest, zebra, tsessebe, antelope, cheetah, hyena and many bird species such as marabou, pelicans and storks. This is an incredibly beautiful park that is particularly well known for the large herds of Kafue lechwe, unique to the Kafue flats. Other antelope include the blue wildebeest, kudu, oribi and buffalo. Water birds are especially abundant. The Gwisho Hot Springs occur along a natural fault line and are located on a site that was once the home of a Stone Age settlement. Today the springs are surrounded by palms and lush vegetation where the waters rise by convection from depths of over 1 km. Sebanzi Hill is a nearby archaeological site which has been excavated. It was the site of an iron age village, inhabited for most of the last century. This is one of the smallest parks of Zambia, but none-the–less is home to 8 lakes, 4 rivers, many wetlands, forests, lagoons and dambos that support a unique variety of animals and abundant bird and fish. There are fairly large herds of the swamp-dwelling sitatunga, reedbuck and waterbuck. 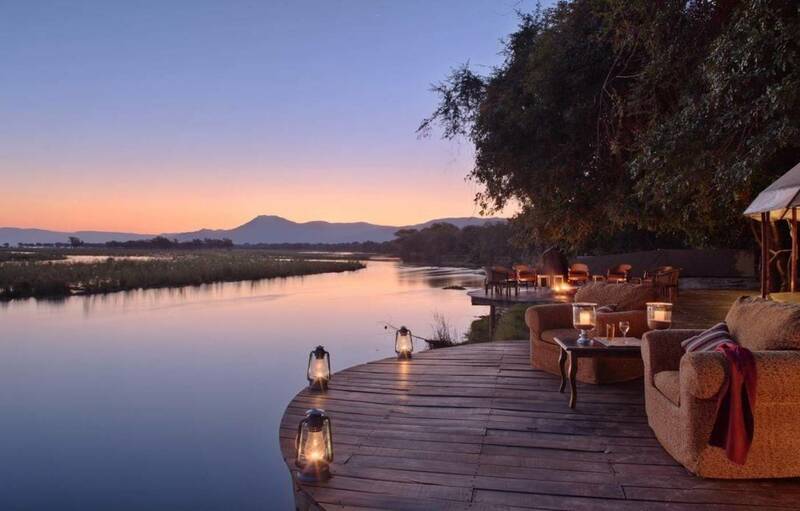 You can also spot crocodiles, hippos and even witness the bat migration between November and December. There are 460 species of bird, and the park is a true birdwatcher’s paradise.